Trees can record centuries of history in their rings – changes in rainfall and temperatures, even evidence of fires sweeping through a region or the climatic impacts of volcanic eruptions. Annual rings are common in trees that experience seasonal climate variability and dormancy, but in the tropics, these records are rare. Now, for the first time, scientists have documented consistent annual tree rings in a native species on Hawai’i. The history recorded in the ring widths could improve our understanding of the climate in the eastern tropical Pacific, a region where much of the variability of the El Niño-Southern Oscillation (ENSO) originates. It’s also an area whose forests are home to many unique and threatened plant and animal species. The trees – Sophora crysophylla, commonly known as māmane – were found on the slopes of Mauna Kea, a dormant volcano on the island of Hawai’i that gets frost and even snow during the winter months. In 2009, a fire swept across the area, killing several of the trees. From those trees, the scientists were able to cut full cross sections of the trunks to compare and analyze the tree rings. They found common patterns of annual ring growth between trees that could be cross-dated, establishing the annual nature of ring formation in māmane. The scientists describe their research, funded by the Climate Center at Lamont-Doherty Earth Observatory, in the Journal of Tropical Ecology. Tree ring research, or dendrochronology, typically works with species of conifers or deciduous hardwoods, which have been used to develop drought atlases for North America and the Asian monsoon region. The discovery that rings in the flowering māmane on Mauna Kea were annual and could be cross-dated between trees came as a surprise, said study co-author Ed Cook, a dendrochronologist with the Lamont-Doherty Earth Observatory Tree Ring Lab, which celebrates its 40th anniversary in September. The search for annual tree rings in Hawai’i stemmed from concerns about food for endangered native bird species and how climate might affect seed production, but the discovery also has wider implications for understanding of the El Niño-Southern Oscillation. Local tree rings from the Pacific islands could lead to greater understanding of the region’s climate, including during the years when El Niños and La Niñas occurred, by providing records of alternating patterns of warm and cold events and changes in rainfall variability. Isotope ratios in the wood itself could also provide a measure of that variability. Corals near the islands also produce annual growth bands that record isotopic signatures of ENSO variability, and the māmane samples indicate the potential for providing an annually resolved record from a terrestrial archive that can complement and expand upon the coral records. So far, the māmane chronology reported in the paper goes back to 1926. 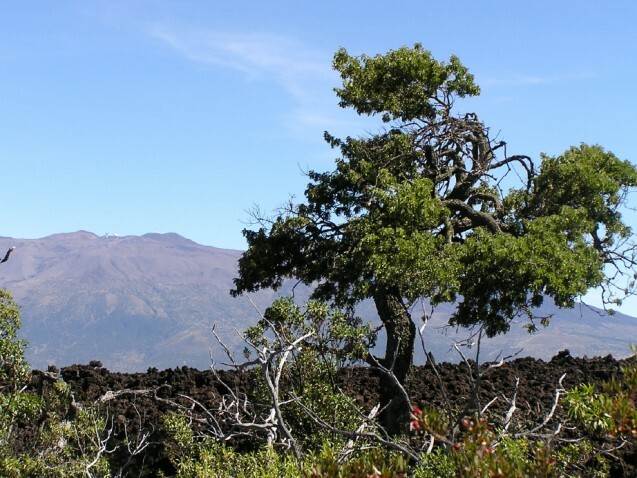 Cook is optimistic that abundant remnant wood from dead māmane on the slopes of Mauna Kea could provide as much as 200 years of tree-ring data. Cook worked with Kainana Francisco and Patrick Hart of the University of Hawai’i; former student Jinbao Li, now of the University of Hong Kong; and Patrick Baker of the University of Melbourne.